Filtering photos has long been a popular obsession of iPhone users, whether through Instagram, Afterlight, Snapseed, or the Facebook Camera app. 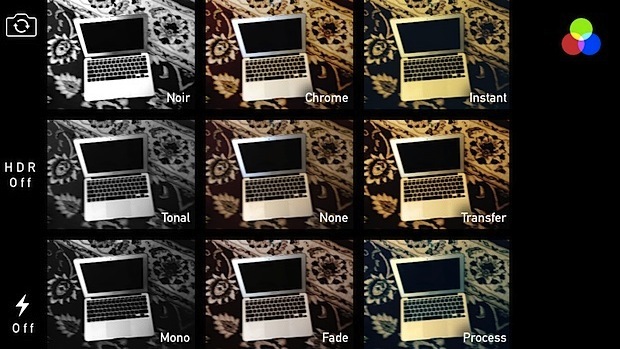 Apple took that popularity to heart and built a variety of filters directly into the iOS Camera app, though the feature has gone largely overlooked by many users. Unlike some of the more garish third party iOS filtering apps, most of the bundled iOS 7 filters are fairly subtle, making them reasonable to use to enhance a pictures appearance. There are two ways to use native filters in iOS: with the live camera, which we’ll cover here, or after the the photo has been taken through the Photos app, which is for another article. Yes, live filters work for the iPad and iPod touch running iOS 7 as well, but our emphasis is going to be with the iPhone since that is what most people use for a point-and-shoot camera. Using live filters is quick and will add that chosen filter to every image taken with the Camera app while it’s set. 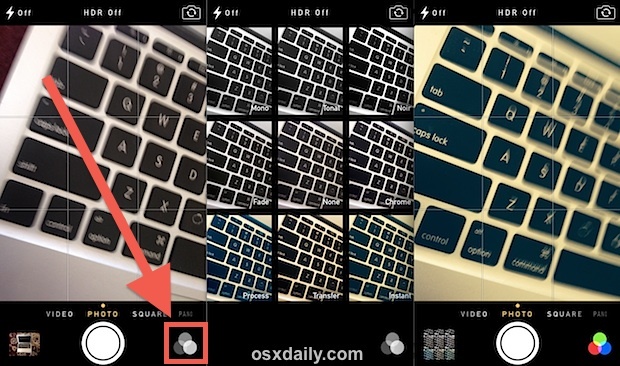 Photos taken with a live filter will be saved to the Camera Roll using that filter. Be aware that this filter becomes the new default setting until you change it again, or set it back to the default “Normal” mode. As already pointed out, you’re really better off toggling filters on the live camera, pointing it at a variety of objects, and looking at the differences yourself to see how each filter setting looks. There’s little harm to taking images with the filters applied through the live camera, but iOS allows you to adjust them after the fact, or even remove the filter entirely by editing the image through Photos app. Of course filters are just one of may possibilities for the iPhone camera, don’t miss our other iPhone photography tips to learn much more. Paul, there’s a mistake in the last paragraph. Where it says “Ok course filters are”, it should say “Of course, filters are”. Doh! Thanks for catching that, appreciate it! One little mistake: the three circles are not concentric (they don’t share the same center), rather they overlap.